All water heaters have a safety valve designed to release excess pressure from the tank in the event that the water gets too hot. This valve, often called a TPR valve, prevents the tank from building excess pressure. It acts as an overflow for the tank, and serves a very important purpose if the thermostat malfunctions. If the pressure relief valve is leaking for no reason, it can prevent the water from heating sufficiently. 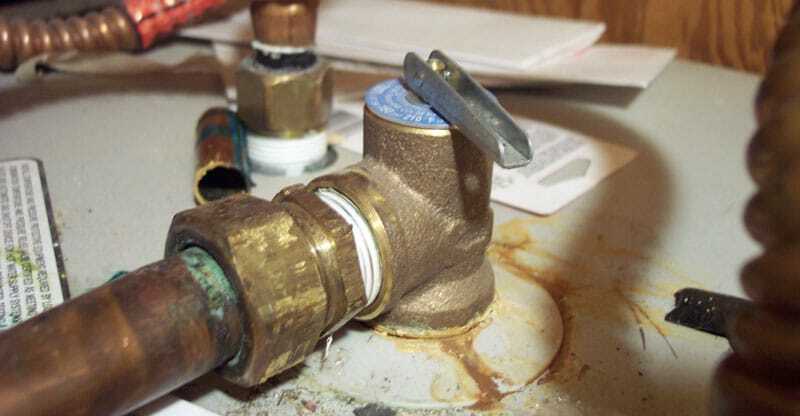 Here’s how to test and replace a pressure relief valve. There is a simple test to determine whether the TPR valve is operating correctly. First, place your hand on the overflow pipe leading away from the valve to determine whether the line is hot. There should be some warmth next to the valve, but the line should only be hot if the valve is faulty. If the valve passes this initial test, lift the test lever on top of it. This opens the TPR and should allow water to flow. The overflow line should begin to heat up immediately, and you will hear the sound of water passing through it. If the valve does not lift upwards with slight pressure, or it lifts but there is no corresponding heat or running water, then the TPR is faulty. This test should be performed before regular maintenance, or at least once a year. Before doing any work on a water heater, you should always turn off the circuit breaker or set the gas control valve to the PILOT setting. Leaving the power or gas on when the tank has been partially drained can cause serious damages or injuries. Turn off the cold water inlet valve. Turn on the hot water faucet closest to the tank and allow the pressure in the tank to drain. Models with a TPR located on the side need to be drained until the water level in the tank is below the valve. A good rule of thumb is to connect a garden hose to the drain outlet and fully drain and clean your water heater while you have it shut down. You will have to disconnect the overflow line leading away from the TPR valve. This usually means cutting the pipe, but some units will have a special coupling installed to allow easy disconnection. Be prepared to have a temporary leaking pipe when it is cut and clean up the water with a rag or sponge. 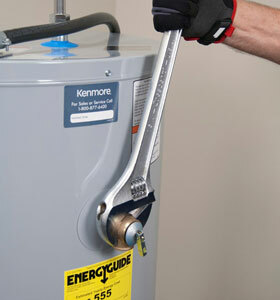 Unscrew the overflow pipe from the TPR valve using a large adjustable wrench. There are several styles of TPR valve available, including universal pressure relief valves. It’s important to choose a replacement valve with the same BTU rating and pipe size. Take the old valve to the hardware store, and buy a replacement valve that matches it. Wrap the threads of the new TPR valve with plumber’s tape or apply joint compound liberally. Screw the valve into the tank until it is hand tight and then use a wrench to tighten it until the outlet is facing towards the overflow drain pipe. Reconnect the drain pipe. If the pipe is PVC or CPVC, you can splice the cut pieces using a coupling and the appropriate type of cement. Allow the cement to dry for at least one hour. For metal pipes, there are compression couplings available to join to straight edges, or you can convert from metal to PVC. Turn off the hot water faucet you opened earlier. Turn on the cold water inlet valve and allow the tank to fill. Make sure that there are no leaks. Reopen the hot water faucet and allow it to run until all of the air has escaped from the tank and line. Restore power, or set the gas control valve to the normal operation setting. Set the thermostat to the desired temperature. Allow the water to heat for one hour and then repeat the TPR valve test. Is Your Water Heater Leaking From The Top? Thanks for the article. I’m by no means a DIYer but I managed to replace the valve using your guide a bit of help from Youtube.